Belgrade-based N1 reporters are branded “traitors” and “anti-Serbs” on social networks and have received threats to their lives, those of their families and a message that their office will be blown up, N1 reported. The police were informed about the threats. Milenko Jovanov, a deputy leader of the ruling Serbian Progressive Party (SNS), headed by the country’s President Aleksandar Vucic, alluded on his Twitter account that N1 was not objective and had recognised Kosovo’s independence. In its weather forecast and other graphic illustrations, N1 treats Kosovo in line with the United Nations’ resolution. However, Jovanov’s tweets caused a chain reaction in which N1 was labelled CIA television, described as treacherous, shooting at the truth, with reporters who were mercenaries and spread anti-Serbia propaganda. After the reports on anti-government protests that started in Belgarde two months ago and spread to over 50 places across Serbia, N1 journalists received a threatening letter. “Do you have families.. you’re killing our children and grandchildren, and are unaware that if the destruction happens, your building will be the first to be blown up, and you may lose your dearest. That’s why we, the veterans, warn you not to play with anyone’s destiny because your fate is in our hands,” said the letter to N1. 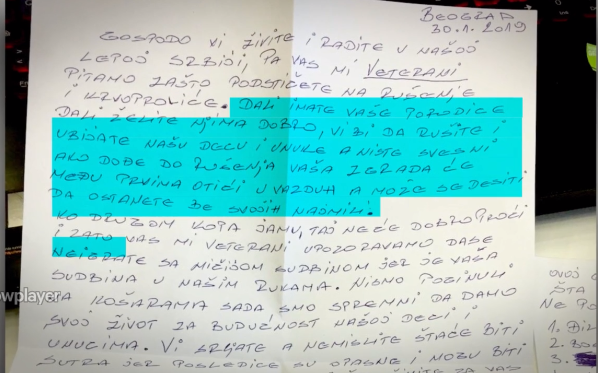 Someone signed it as „Belgarde Veterans of 1990s wars, “but the president of the association Zeljko Vukelic said it had nothing to do with that, adding the police should investigate the threats. So far, the competent institutions have not reacted to any of these warnings and threats.